Prafulla Kar is an award winning Odia Musician, Singer, Lyricist, Writer and Columnist. For more than four decades now Praffula Kar has audiences and fans in Orissa and abroad with his distinctive singing , compositions and lyrics. His Position as a performer is Pre-eminent the compelling power of his music continues to attract a large cross section on the listening public. Added to this oblivious talent, his precocity as Music Director and Poet have gradually transformed him into a Cultural Icon of formidable standing. 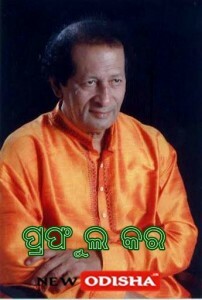 Prafulla Kar born on 2 February 1939 into a family of Musicians, Praffula Kar showed early promise as a singer at home in Puri, the abode of Lord Jagannath. His fathers elder brother Sri Khetra Mohan Kar was a renowned Table Player, who could bring down the artistes of National repute Like Hirabai Barodekar, Maitra, A kanan & Malabika Kanan and many others as family friends to their home. This adorable child of Baidyanath Kar and Susila Kar had opportunity to listen such veterans from childhood and music start ed flowing in his blood at a tender age, but he lost his father at an early age. His career started growing under the guidance of his maternal uncles. His grand father Bhagban Mishra and grand mother Apanna Devi rightly brought him up with moral and spiritual influence. Give Responses for "Prafulla Kar Profile and Biography : Famous Odia Musician"